The role of Quandora domain administrators, along with Knowledge Base (KB) Managers and Editors, is pretty important as it can shape how users interact with the product, ultimately having a significant impact on the success of your organization’s knowledge sharing strategy. Part of these roles’ interest is structuring the content in a way that allows easy and smart discovery by their users. That’s why the latest features in Quandora are focused on precisely this area, in order to support them in their mission. 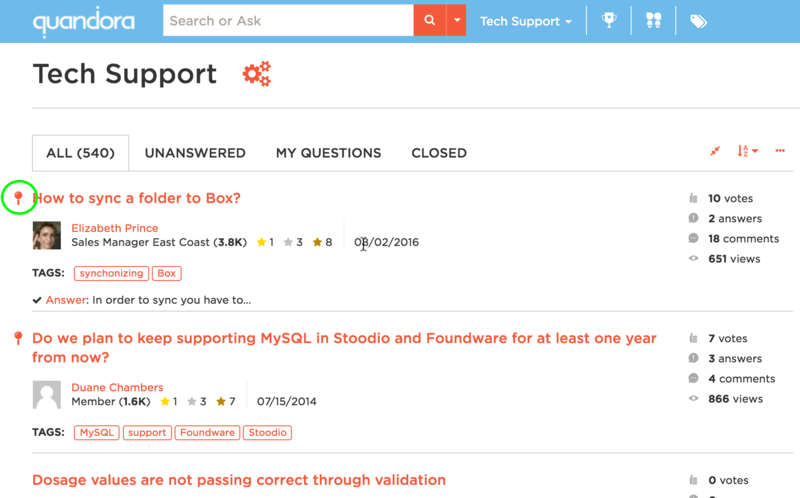 You can now pin questions that are important to your organization, like the ones you want users to easily and frequently catch sight of. 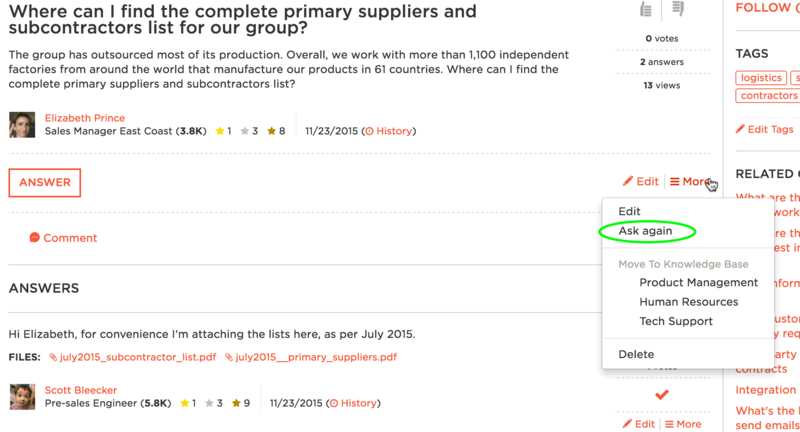 The pinned questions are always displayed on top of Knowledge Base (KB) listings, regardless of their creation date and the selected ordering option. Note that this is not the case for the search results: the pinned questions don’t appear on top of that list. Sometimes, for various reasons, a question doesn’t get answered immediately, and it gets “pushed” down the list by newer questions. KB Managers or KB Editors may want to give it another chance by putting it on top of the list again. They can do that by choosing Ask again from the More menu in the question’s page. Note the difference between pinning a question, and re-asking it: the former puts it on top of the list permanently, the latter only until a newer question gets posted in the editor’s zone to insert them in the text. 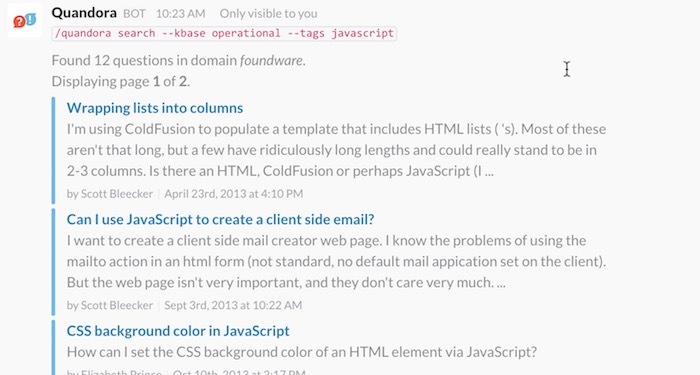 Slack users, rejoice! 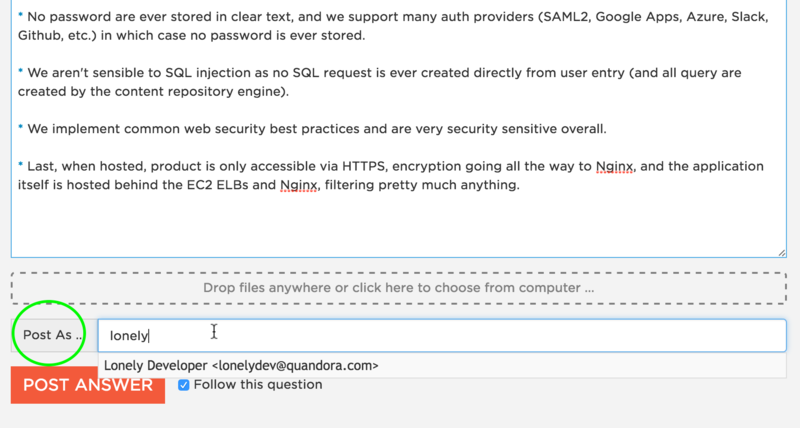 We already had an integration with this great communication tool, allowing to share Quandora activity on Slack channels. We now added the possibility to make searches in Quandora directly from Slack. We wrote an informative blog post about it. Actually, stay tuned: coming soon, the possibility to save Slack content in Quandora, among other things. 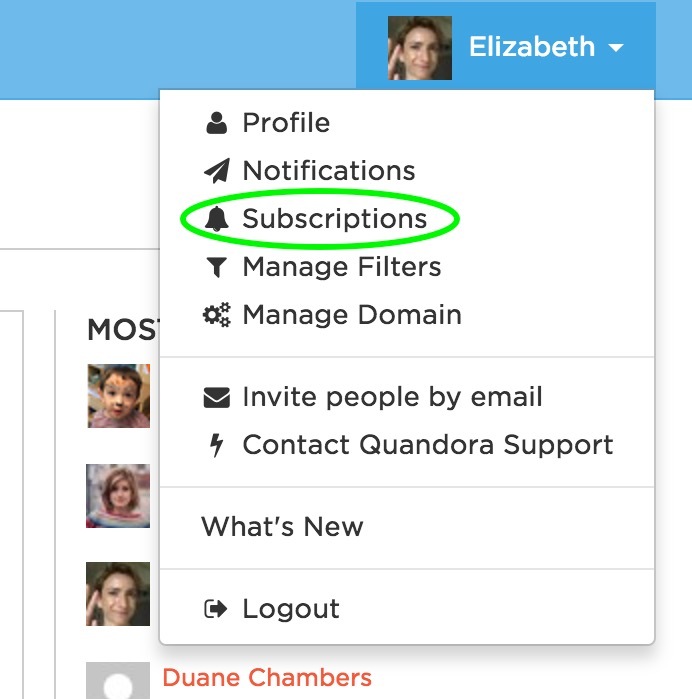 Small but, we think, very useful addition: there is now a Subscriptions entry in the user menu, located on the top right of every page. By clicking on it, users (no matter their role) will access a page where they can manage their subscription to users, tags, KBs and questions in a centralized way. For the next releases, we’ll mainly focus on a couple of strategic integrations, including Slack. We also plan to integrate external sources in Quandora’s search and thus allow users to see results from their other content oriented tools right here, in Quandora. We hope you’ll find using the new features useful and easy to use. We would be happy and grateful to hear from you about what you like about them, what you don’t like, and what else you’d like to see. Just drop us a message at contact@quandora.com or support@quandora.com.